An MP revealed that he was HIV-positive during a debate on public health in the House of Commons. 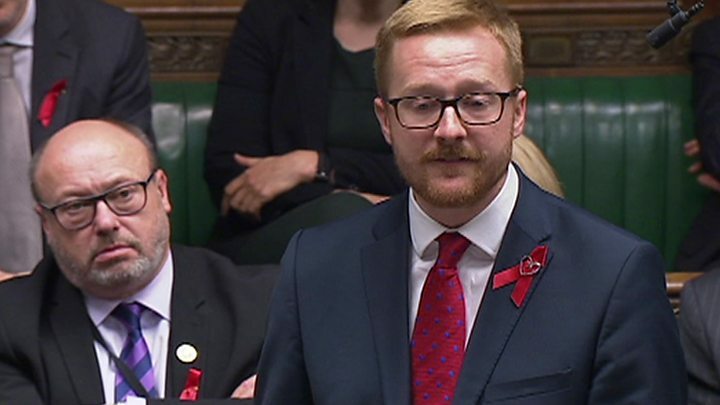 Lloyd Russell-Moyle, Labor MP for Brighton Kemptown, is the first MP to reveal his HIV status in the House of Commons and the second to reveal that he has the disease. He stated that he felt compelled to report a problem that concerned him personally. Russell-Moyle urged ministers to review cuts to sexual health budgets. To discover that he had the virus was a "real shock", but it was not "the end of the world, even though it may seem like that for a few seconds," said Russell-Moyle, 32 years old. "The journey has been long, from fear to acceptance, to today's advocacy, to knowing that my treatment allows me to stay healthy and protect myself. any partner I have. " He added: "Finally, I wanted to be able to speak here and tell all those living with HIV that their status does not define them. "We can be who we want and for those who have not been tested, perhaps because out of fear, I say that it's better to live in knowledge than to die in fear." The MP said he chose the timing of his announcement to mark the 30th World AIDS Day, to be held on Saturday. Russell-Moyle said he wanted to reassure others that HIV-positive people do not define them. In 2005, Labor MP Chris Smith told a newspaper that he had been HIV-positive for 17 years, months before he became a peer. The former Labor Cabinet minister "had been very supportive," said Russell-Moyle. Ian Green, general manager of the Sexual Health Advocacy Association, Terrence Higgins Trust, said the announcement of Mr. Russell-Moyle "is a big help in normalizing HIV in the spirit of public "and help fight the shame associated with the virus. Union leader Jeremy Corbyn praised the member's "brilliant and historic" speech. He said: "I am very grateful to have mentioned my good friend Chris Smith who, in 1984, very bravely told the world that he was gay and proud of being, and we are proud of Chris for doing it. " During the debate, Russell-Moyle said he thought the country was "at a real crossroads" to determine where to go with HIV. He said: "We are starting to really see the tools in our hands to eliminate HIV, really start to reduce HIV infections. "But at the same time, the government is starting to cut budgets for sexual health." Mr. Russell-Moyle added, "We have the tools but we seem to be going in the wrong direction." Health Minister Steve Brine described the speech as "incredible" and "brave". He said that HIV treatment and attitudes towards him have evolved, adding, "We can be very proud of the government's record for many, many years and, of course, of all parties."